ACEH -- Exxon-Mobile has a 60 bscf/day facility near Aceh. In the span of 4 years it extracts more than one cubic mile of natural gas from the formations directly at what ended up being the epicenter of the Aceh earthquake. The gas field there has been producing for much longer than four years, and is one of the largest such facilities in the world. I have been asked, by one of my students, to write something about the Indonesian earthquake near Aceh and the tsunami it created, and its possible causes, and so have; now that sufficient time has passed for you all to see and hear all about it; decided to make some comments on it. There has been speculation on the Internet that the earthquake near Aceh was caused by man, through sonic-surveying of the area looking for new oil-reserves, causing whales and dolphins to beach themselves because of the intense pain it causes them, and/or a nuclear device, or HAARP. Whilst any or all of these causes is quite possible, there is also another more probable and simpler possibility that could very easily have caused this earthquake and many others around the world. That other cause is the extraction of oil and gas from the immediate area around Aceh, and from around the world where other earthquakes occur. World oil-production alone (not including natural-gas) is approximately 80 – 100 million barrels of oil per day. Yes, 80 - 100 million barrels per DAY. That is a tremendous volume of oil, too large to even visualise in your mind’s eye, and it is being extracted EVERY DAY. 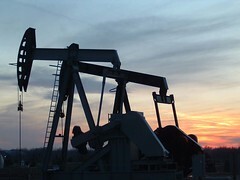 The world’s oil-fields are pressurised naturally by natural-gas within the oil, and you have all probably seen “oil-gushers” on films about oil-strikes, and how the oil shoots high into the air as it is forced out of the ground by the natural-gas-pressure in the under-ground oil-field. The oil is not only pressurised, but is also hot, and, as it is extracted, the pressure gradually decreases until the oil-well is no longer pressurised (like an empty aerosol can that still has some liquid in it) and becomes less profitable to produce oil from, as the pressure decreases to the point where the oil needs the use of external-energy to be pumped out. In some cases, in order to extract the remaining oil, cold-water is injected/pumped into the well and the oil floats on top of the injected water, so as the oil-well fills with cold-water the last remaining oil floats up on top of it, through the well-head-riser to the surface, until the well is empty, but not “dry”. During these various stages the globe of the earth is gradually being depressurised and cooled internally, causing contraction for both of these reasons. When objects cool-down they automatically shrink/contract in size. If you let high-pressure air or gas out of a cylinder it forms ice around the outlet, and cools the entire cylinder. If you let some of the air out of a football, or basket-ball, the ball shrinks and goes badly out of shape. Apply that to the Earth and you have earthquakes – simple common-sense – not rocket-science. A fact so simple that anyone who understands the oil-extraction process would understand, but, because they are insanely-blinded by their insatiable greed and avarice, they often overlook the obvious. Another obvious fact that is never quoted in relation to global-warming is that internal-combustion-engines do not just give-off green-house gases, they also give-off tremendous heat – every single one of them. If you don’t believe me, try putting your hand near the cooling-radiator or exhaust manifold of a hot engine. The professors never factor this into the equation, and never mention it in the news. They only mention the gas-emissions. Think about the millions of engines giving off tremendous heat every day, some all day every day, as well as the green-house gases and that is one reason why the scientists/professors prognostications are always wrong, and the ice-caps are melting much faster than they first predicted, and faster than they are still predicting wrongly now. These people think they are really clever and profess (professors) themselves to be wise, when in reality they are all fools, as God tells us quite clearly in Scripture. King of kings’ Bible - Romans 1:22 Professing themselves to be wise, they became fools, . . .
5:21 Which some professing [to have] have erred concerning the faith. Grace [be] with thee. Amen. 68:14 Since they (men) were only created, so that, like the angels of heaven, they might remain righteous and pure. 68:16 But by this, THEIR KNOWLEDGE (science - 1 Tim. 5:20), THEY PERISH, and by this also its power consumes them. Many people have asked why God allows things like this to happen, the answer is simple – free-will. He warned you not to listen to Satan and to obey ONLY Him, and even told you, well in advance, what would happen if you didn’t take heed of His warning. So, it is your own fault, not His. Instead of listening to God, you have preferred to listen to, and vote for, your false-god, lunatic, false-prophet politicians, some of whom say that they planned by 2005 to cut back green-house-gas emissions to 1991 levels (and have failed to do so), when the levels in 1991 were already melting the ice-caps and changing the climate. Insanity. Do you still want to keep extracting and burning all the oil and destroy yourselves and every other living thing on Earth?, or force governments to release the free-energy technology that they have been hiding for approximately the last 120 years, since at least as far back as the time of Nikola Tesla and Dr. T. Henry Moray and others - the same 120 years during which the planet has been being destroyed. It is the big oil companies and the evil insane people who own them who are destroying the planet, for their own insatiable greed. The ONLY way you are going to stop them is by enforcing The Plan against the traitorous Hidden Hand, N.W.O. Zionist banksters who own the politicians and by then running cars and other vehicles and power-generators on free-energy that does not create any green-house gases. All these things are possible if you enforce The Plan, and, if you don’t, then you have NO future. Whom or what will you serve?